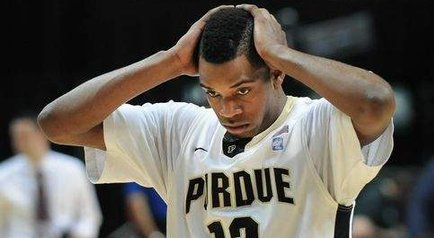 So just as this Purdue team was starting to gain traction for the first time all season, stupidity strikes, and the end result is a starter/sixth man is no longer on the team and another is suspended. Matt Painter did the right thing here...and I'm sure this is something he was hoping to never have to do. He had given Barlow a small margin for error following his problems and subsequent suspension last season...so last night's fight, that seems to have stemmed from Barlow acting like a hot head, ends with Byrd suspended and Barlow booted. MSU manhandled a full-strength, but fatigued, Purdue squad last month...and to beat them, Purdue would have greatly-benefitted from everyone being available and focused on the job at hand. Instead, you have a bunch of players that have been given the gag order from Painter about last night's incident, who are surely thinking about what went down, trying to get back to the job at hand- beating the seventh-best team in America. With the disciplinary action, LewJack, TJohn, Smith, AJ and Hart will have to play good, no, great games to beat MSU...as will the rest of their teammates. "Are you F-ing Serious that this is happening...Again?" Feb 17 Byrd, Barlow, Boilers, Blow their own foot off.